On April 11, 2011, I stood with Joe McGill and 20 other people preparing to walk down a white shell road through 100 very old Live Oak trees. We were walking into an empty village, a village that was home to people for 200 years, ten generations. It was dark, the wind had blown out our candles. It was silent, so were we. Later, I sat on the steps of one of the slave cabins, listening to the Litany of the Libation to the Ancestors. I can very much relate to how Ms. Boddy felt. A little apart. Curious about her fit. I feel that way often when I talk with people about the stories I am researching, the enslaved people I am writing about. How is this possibly my story to tell? Yet, when I sit down and settle into myself, when I get over my own nervousness and fear, I feel myself woven into these stories. The daughter of the manager – the modern-day equivalent of the overseer. The writer, the educator by training and vocation. The researcher on Dr. King’s legacy. The one returned, at just this time, for just this purpose. Somehow all the strands of my life have brought me here. Now. With these words. Perhaps, though, the largest part of my reason for writing is that I not only want to tell these stories, to sketch these people back into history with words, but that I also feel a responsibility to do so. How could I – with my education, knowledge, and skills – not do this? How could I, as a white person who has lived in the privilege of my skin my whole life, not use that privilege to spread it broader? How could I know what I know and not say something? So I say. I say every day. Even when I’m nervous or fearful. Even when I feel apart and distant. I say these stories. I whisper them onto the page and into the air and hope they will hear their names and know they are not forgotten. What stories do you feel like you have a responsibility to tell? Which make you nervous? I just recently came across Joe McGill’s work. 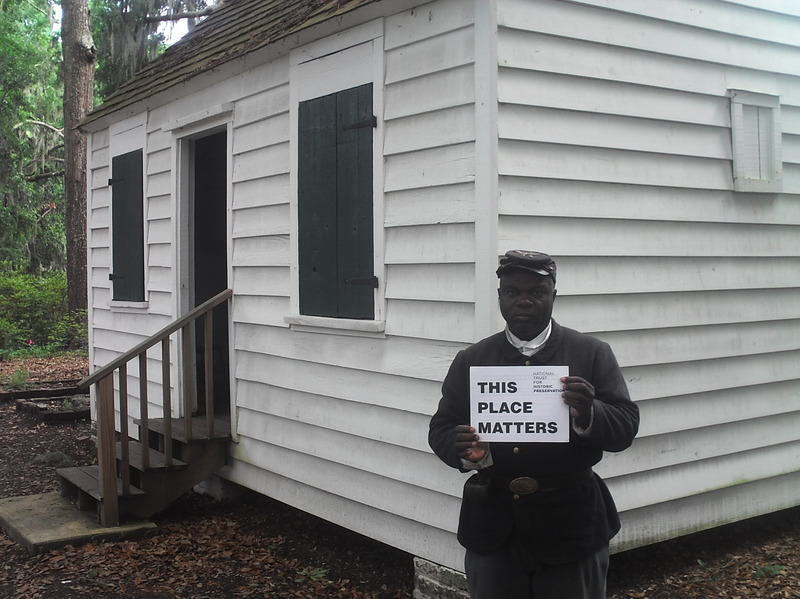 Mr. McGill travelled the South and slept in slave cabins to show, as the sign above says, that these places matter. If you’d like to know more about this project, this NPR story about him is great. You can also read his blog about the experience here.